Destructive bark beetles have been munching their way through vast tracts of pine forest in Western Canada and the United States. Researchers may have found a line of defense against the bugs: sonic warfare. 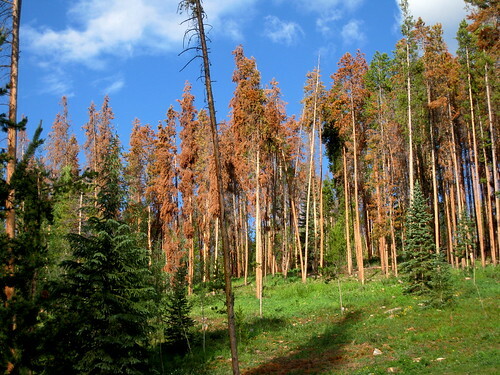 Scientists at Northern Arizona University have found that loud sounds can repel bark beetles, reports The Adventure Life blog. So then Hofstetter and his team recorded the noises the beetles themselves make, tweaked them, and piped them back into the ant farms. The results were nearly instantaneous. The scientists have developed an “anti-beetle boom box” that will cost about $100 a tree—too expensive and labor-intensive to use on every tree in the forest, no doubt, but for possible use on high-value trees or, The Adventure Life speculates, a wall-like defense line against the invasion. Call it a wall of sound. The scientists expect the devices to be ready for market by 2011. Image by vsmoothe, licensed under Creative Commons.